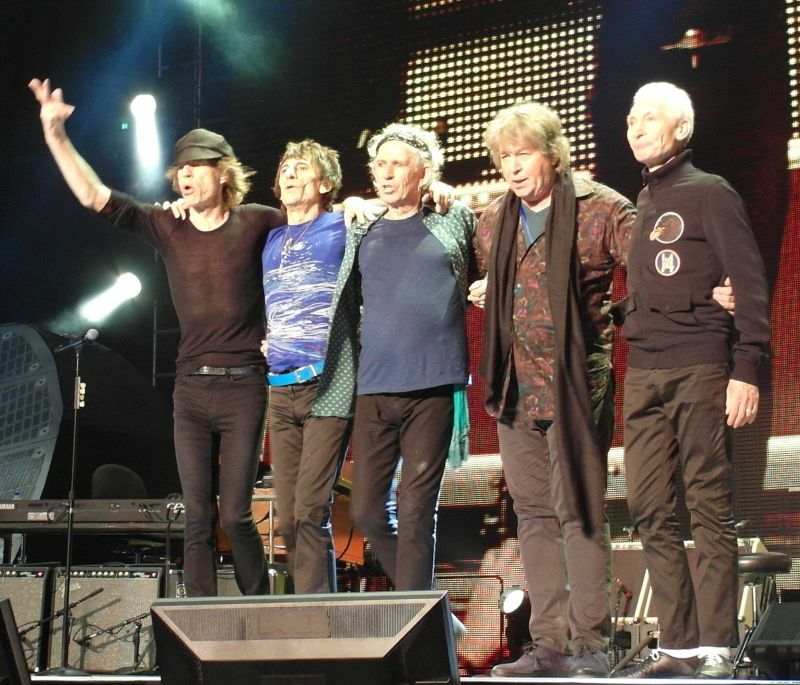 This was the day The Rolling Stones started to announce the shows for the upcoming tour in Europe. The rumours about shows in Landgraaf, Werchter, Oslo, Lisbon and many other European dates had been flooding my inbox and I was running late for the show. Working hard on sorting out all the rumours and other work I was running really late, but at 6:30pm I am out of the door. It is raining heavily so rather than walking the 20 minutes over to the Merzedes Benz arena, I get a taxi. Even with queue it takes just 10 minutes max. And cost 15 in local currency which is about two Euro, not bad. The venue speakers keep informing about gates. The place is swarmed by guards, I find my gate and I am inside in two minutes. Security, metal decetors beeping, I am in, no worries. It is still not even 7pm, and the ticket says show start 8pm. I walk around, see my seat, it is actually a seat in the pit. There are some 13 rows nitely loined up with around 25 chairs in each row, and they are all taped to the floor, so that it will not be a mess. It is unusuaL, but as I will see during the show, again no worries. They are on stage at 8:28pm, nearly half an hour late, but just in time for the expected curfew of 10:30pm. Jumping Jack Flash is a great starter, it kick-start the crowd, ande they did not bother to save it for the last, even if they are two numbers short tonight. 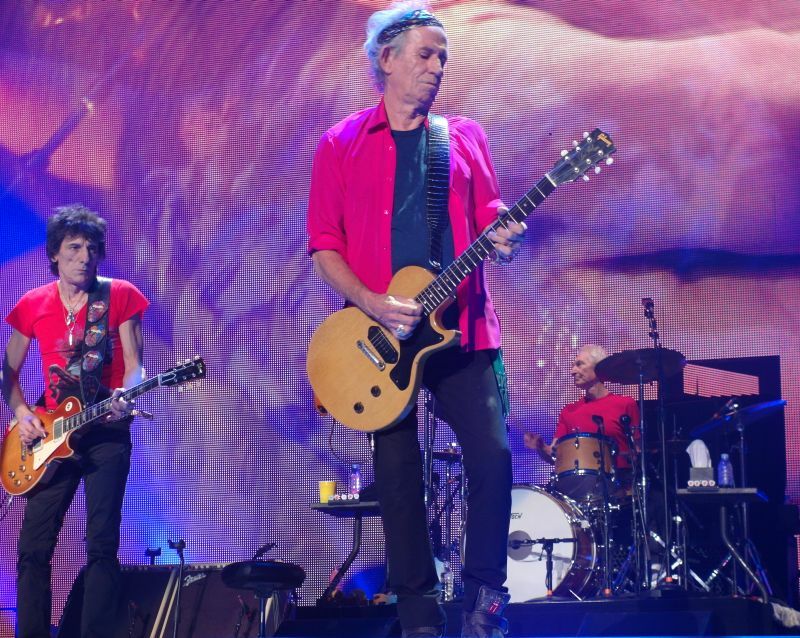 Those who wanted to be front row had self-upgraded by now, just like the procedure was laast time The Stones played in Shanghai back in 2006. See link to that show at the end of this report. The rail on the front row was packed and it gave the Stones the fans they needed up front, plus 300 or so in the pit standing vs 400 or so standing without chairs is more or less the same. The pit crowd was ... ok ... bay be a bit VIP - cool- but not bad. As the show is moving on more fans are self-upgrading up front. The rest of the house is on fire. For those who are into Mick & Keith close contact... Keith "owned" Street Fighting Man. 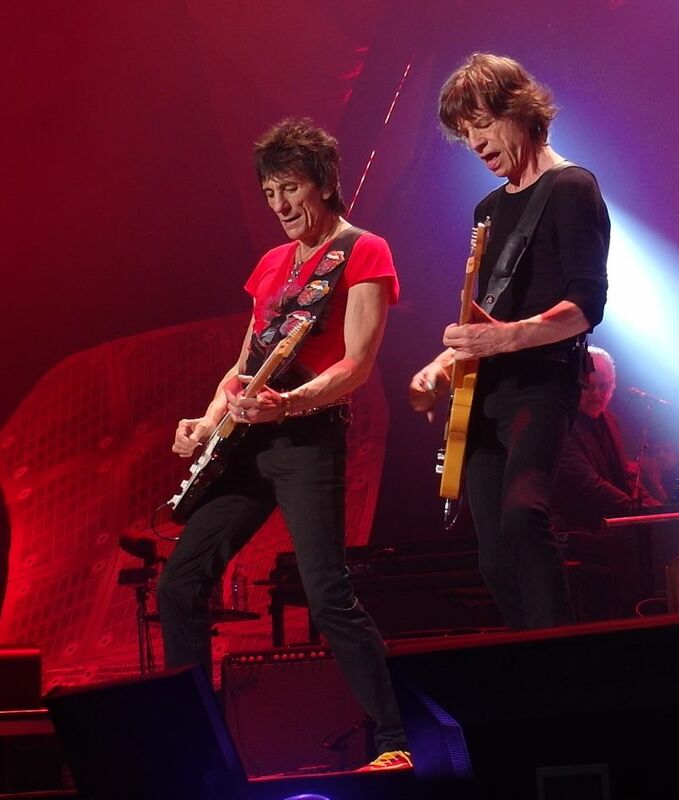 Mick followed Keith all through the song, and as it finished, Mick walked over to Keith and put his hand on Keith's shoulder, sort of thanks pal this was great. Same thing on All Down The Line. They have been performing together so long it just clicks, i.e. it works so smooth. You don't need this "share microphone" thing to see that they enjoy performing together. 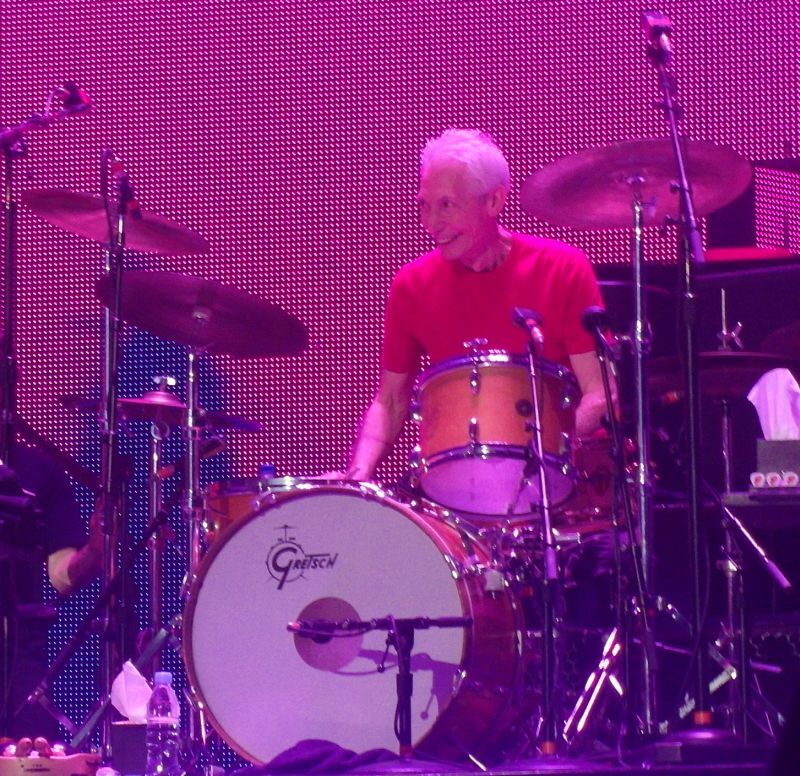 Keith is smiling through the show, and so is Mick. And so is Ronnie and Charlie. It is so great to see that they actually enjoy what they are doing, they are not here to cash in on a budget. But to Rock. And Roll. The set list is different but the band is the same. And when they are into song number 17 which is Sympathy For The Devil, I realized some of the big hits will not be on the set list tonight. No worries, it is only rock'n'roll, but I like it! Keith had some great moments when he was doing complete walks on the tongue stage during his solo on Sympathy For The Devil. And also later on, during Satisfaction. It was like he could not resist going into the crows, even if he likes it in front of Charlie. Mick was all over for two hours, he just had some breaks on the slow songs, and when they strapped a guitar on him, like on Miss You and Doom & Gloom, but as soon as he got rid of the guitar he was again all over. Age 70 mind you. I wish I will be as fit when I am 70. Charlie cool like always, hiding there a bit behind Keith, and Ronnie always great mood on stage, I don't know howe they do it. So far not a bad day on this "14 On Fire" tour. I hope they will keep the engines running at the same high level all through Singapore, Australia and New Zealand! 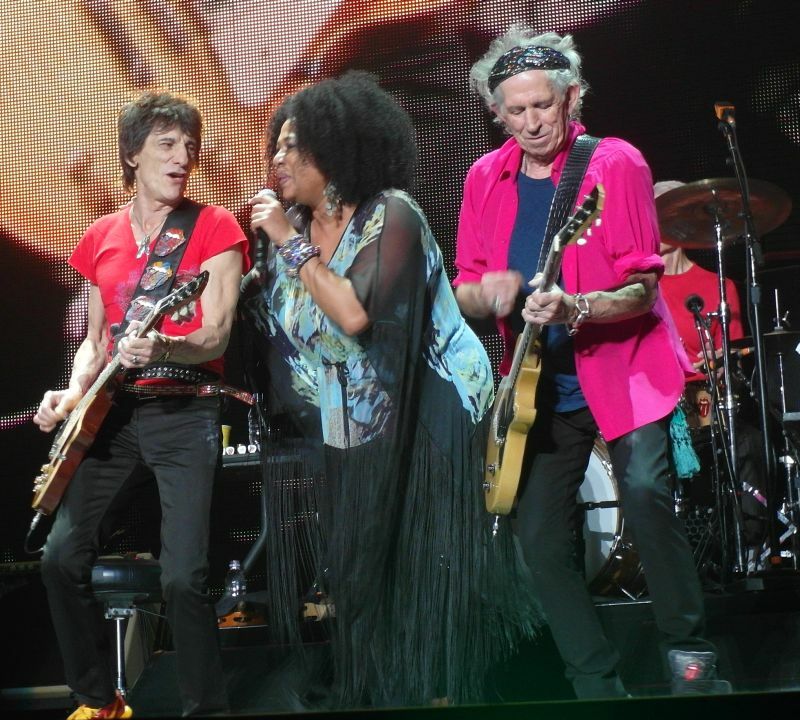 Final note: "Honky Tonk Women" and "Brown Sugar" was not performed tonight, they were ruled out. The video on Doom & Gloom was mostly crowd replay and only bits of the original with flying dollar signs etc, good to see they strip it down when there are circumstances in the news that people might find difficulty vs the video. On All Down The Line the band paid tribute on the screen to their influences of blues, soul, r&b, country and early rock'n'roll. My highlight was definitively Gimme Shelter which I fell in love live back in Wembley and to my fortune I have managed to hear it in most of the shows visited. Lisa is just incredible - had the perfect seat close to catwalk to see and tape Lisa's and Mick's duet. Keith is the God. Simple, but soulful playing and his charisma and love for music and fans makes him the salt of the Earth. Happy has always been my favourite (mission accomplished). Charlie, cheerful and accurate as usual. 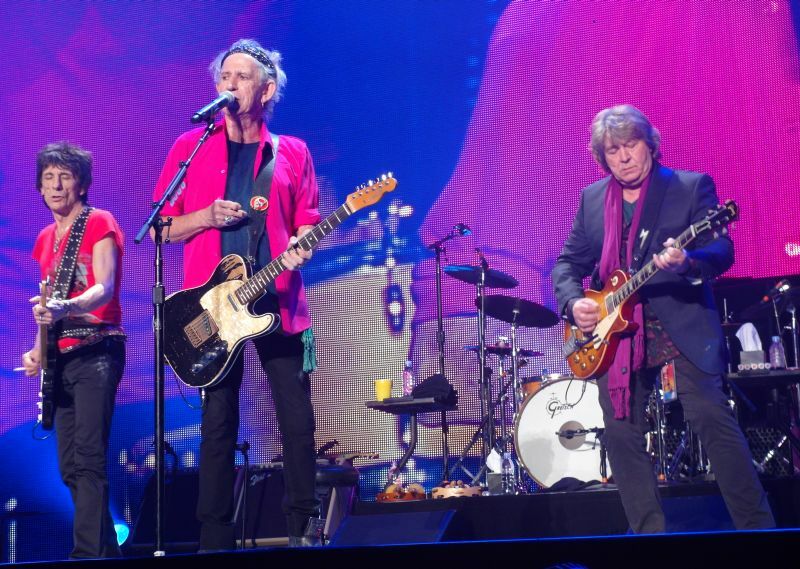 Mick Taylor's musicality shined the arena. Ron played nice steel guitar on Happy. And the usual suspects supporting the show did marvellous job. 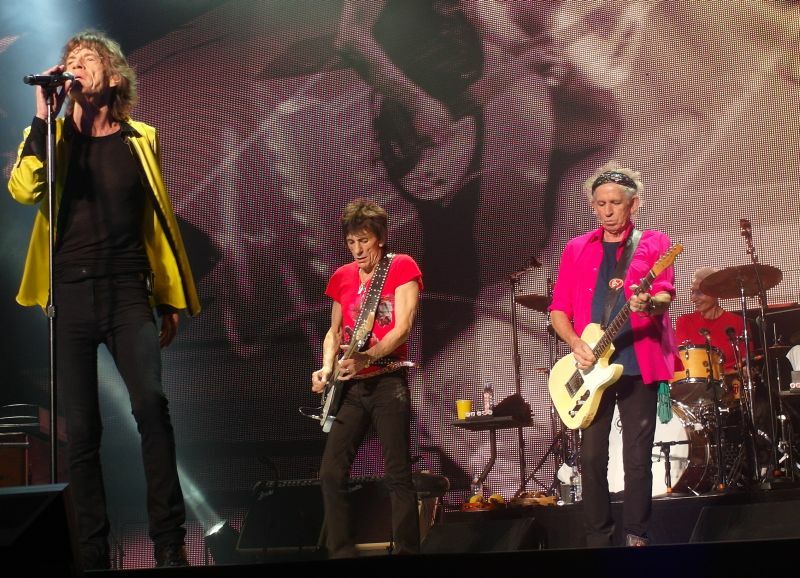 Have now seen the Stones in three continents. It's good to see them here - it's good to see them anywhere. Great show! Lots of expats, quite many Chinese, devoted fans from all over the world. Totally amazing show - soon forgot the 30 minute delay and the pouring rain outside. No real low spots at all. Street Fighting Man was played as a special request (by online voting, I think), which was a bit of a surprise to most people around me; Mick apologised that they hadn't played it for a while and it might not be so good, but it was shockingly excellent. I've seen them twice before, but this was probably even better, and I see no reason why they can't go on for another 10 years . 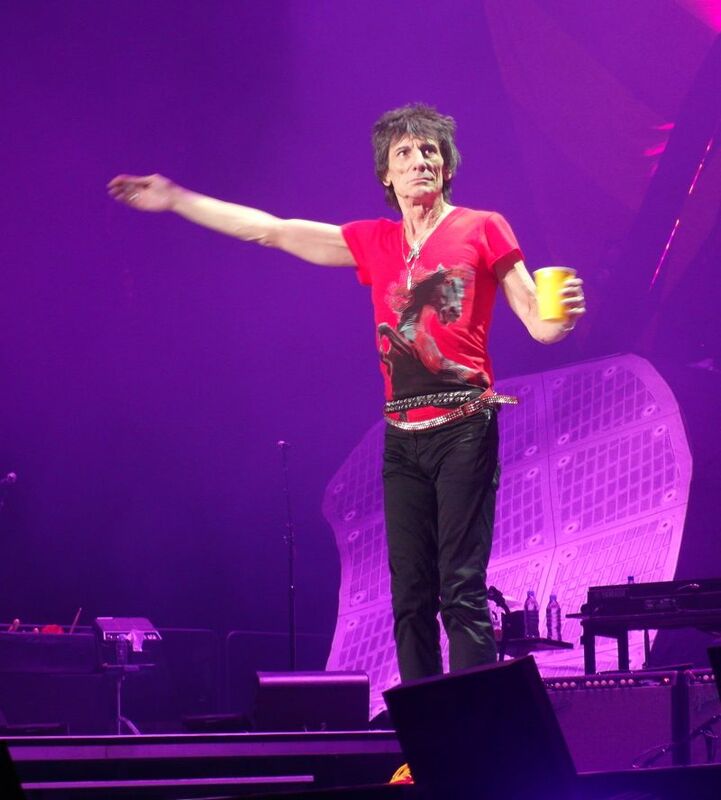 . .
Let me be honest with you I am not the biggest Stones fan in the world nor have I seen them many times. I saw them twice in 1999 (Shepherds Bush & Wembley the same week) and enjoyed those shows and I only found out a week before the Shanghai show that it was on! I am living in Southern China and quickly arranged the flight, gig ticket and hotel. Cut to the Mercedes Arena - it's not too big but a nice size. It was pouring with rain outside but staff and signs were clear where to go and I quickly found my seat. I wanted to be near the tongue but it wasn't too bad - I was next to the VIP section. The ticket said 8pm - at 8pm the Arena was still 3/4 empty. Taking my chance I moved from my seat into an empty seat in the VIP area and about 10 rows from the front. Talking to the people around me none were Stones fans but Mercedes employees given bonuses / freebies! By 8:25pm pretty full and The Stones took to the stage shortly after this. Opening with 3 rockers the place was alive except around me! A group of 6 people - 2 were texting, 2 just talking and the others were watching with little or no movement. Then the 2 texters got up and left after IORR! They got everything together and were not happy for some reason (Two seats closer for me). Then after SFM another 2 started to leave - I saw another chance and offered them 100yuan for one of their VIP bags. I got the biggest smile from the girl as she handed it over and practically ran out of the arena before I changed my mind (as if I would). I got Ruby Tuesday early in the set and as this is my favourite Stones track followed by SFM and I was already leaving a happy man. Hit after hit then the downer for me. 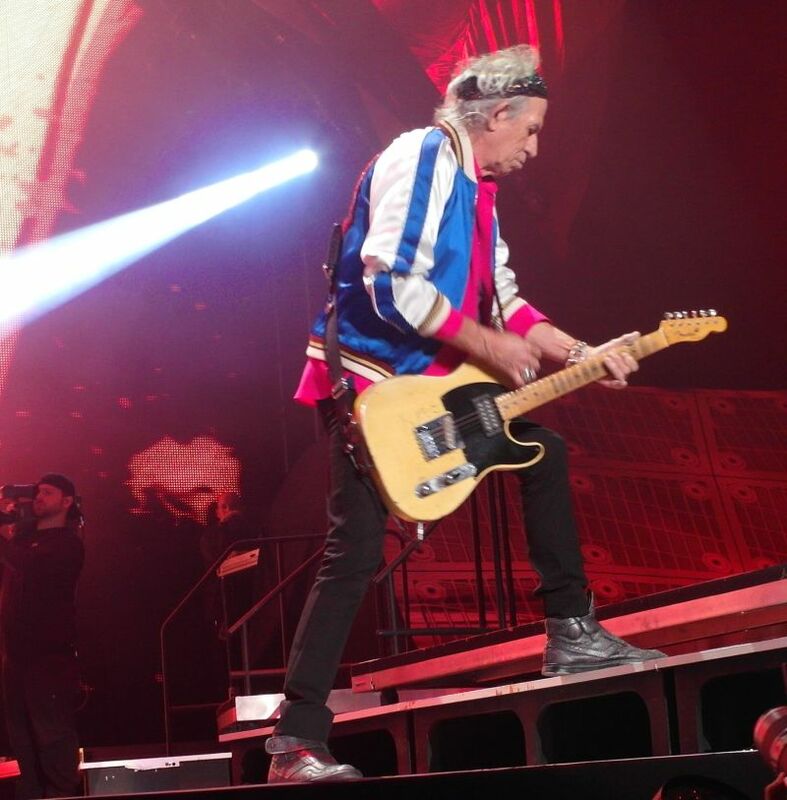 Sorry I know many like Keith's section but Slipping Away was so flat, boring and long that even the girl to my left who had not stopped all night sat down. PIB were really good tonight while Gimme Shelter was as wonderful as ever. The energy from the stage considering their age puts me to shame and all involved looked to be having a blast. The different songs enforced by the exclusion of HTW and BS where nice as I lost track of time and when Start Me Up and SFTD ended it felt like a longer set than 17 songs. The encores were the same as everywhere else (Satisfaction tooooo long) and then they were gone. Leaving the arena I saw a small table with 4 young Chinese men selling 'signed photos'. Some colour, some B/W - all signed in exactly the same places. The starting price was 200yuan. I asked at the official merch and the girl said she knew nothing about it. I returned to the table and the price was now 100yuan. Standing away but keeping an eye they must have sold 15-20 in a few minutes. I was talking to a couple and the girl was very angry as she was taking their photos (these men has official looking passes from the Mercedes Arena). As we passed for the last time they offered us all of the pictures for 100yuan - maybe 6/7 on the table! When I got back to my hotel I looked up some autographs and the ones from the arena were VERY BAD. Bullet dodged! Summing up - I had a great time, the Stones delivered and anyone else going to gigs have a great time when the start up again.